Owners of PK's Farm Fresh, Ajai Gupta and Anil Argawal, said they have lost thousands of dollars in produce. QUEENS — Kew Gardens business owners have lost dozens of customers and thousands of dollars in produce that went bad after losing electricity in half of their store last week, a setback they blame their landlord for, they said. PK's Farm Fresh, located at 81-15 Lefferts Blvd. on the aging Long Island Rail Road bridge, offers fresh fruit and vegetables, dairy products, craft beers, meat, bread and other groceries. 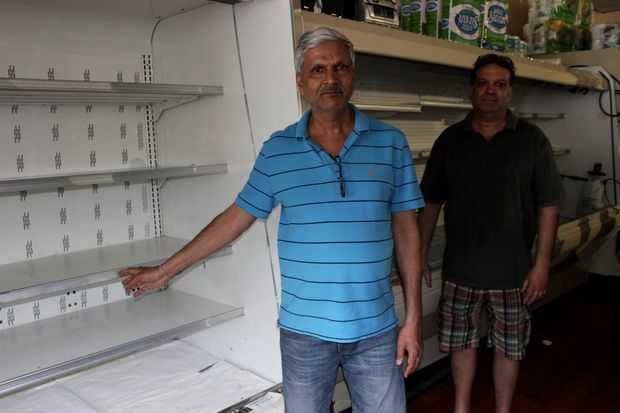 But after losing electricity in half of the store on June 26, most of the shop's refrigerators stopped working, owners Ajai Gupta and Anil Argawal said. “I’m losing money and customers every day,” said Argawal. The owners said the electricity in the store had been tripping for years. About two weeks ago, the property operator in charge of maintaining the stores on the bridge — Long Island-based Zee N Kay Management LLC — hired an electrician who started working on the issue. But the company did not obtain the necessary approvals from the MTA, which owns the bridge. “Safety is the top priority for the MTA, and because these plans were not submitted to the MTA as required, we put a halt to the unapproved work,” MTA spokesman Aaron Donovan said in an email Thursday. “We will expedite review to ensure they’re approved as quickly as possible,” he added. A representative for Zee N Kay said that when the owners took over the store more than two years ago, they installed a lot of electrical equipment which overloaded wiring installations. The representative also said that according to the lease, the store owners are responsible for upgrading any electrical repairs at the store and Zee N Kay only started working on the issue when it became a safety hazard. “It started to become a dangerous condition and that’s why we stepped in and hired an electrician immediately,” he said. The store owners said they hope the issue will get resolved quickly. "Nobody is here," Argawal said, referring to the empty store. "Customers really lost trust in us." The MTA is considering not renewing the lease for Zee N Kay when it expires in 2020, and demolishing the stores on the crumbling bridge instead. Local residents have created The Save Kew Gardens Coalition to fight for the bridge and its stores. The MTA said Thursday that the two issues are unrelated.